Contrary to conventional uniformitarian thinking, I conclude that ignimbrites can fuse under water to form welded tuffs. 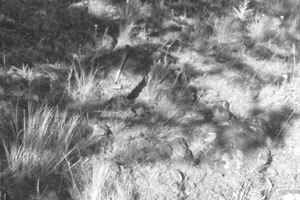 One example is a tuff in the Sierra Nevada Mountains, which was recently reported as being emplaced and welded subaqueously. Another example is a tuff in North Wales, previously interpreted as deposited subaerially, but recently shown to be subaqueous. Field evidence includes marine sequences beneath the tuff, sediment filled gaps within the tuff, and wet sediment fluidisation and steam vesicles at the base of the tuff. Also, a tuff in Eastern Oregon, the Rattlesnake Ignimbrite, was most likely deposited underwater during the Late Abative Phase of the Genesis Flood. Underwater emplacement and welding is also supported by the fact that the ignimbrite is only welded in its middle portion and not at its base or top. A high extrusion rate is probably one of the most important factors for underwater welding. High extrusion rates are not observed in modern environments but expected during the Genesis Flood. Figure 1. Picture Gorge water gap through the Columbia River Basalts in the John Day Country, North-central Oregon. The horizontal Rattlesnake Ignimbrite can be seen at the top of the strata to the left of the gorge (arrow). Creationists explain most of the rocks as being deposited in the Genesis Flood, which presents a number of difficulties that need to be solved. The Flood explanation means that many geological or physical processes must have been very rapid and subaqueous. This puts a severe constraint on possible processes, especially since some processes are conventionally assumed to have occurred on land. One process that is generally assumed by uniformitarians to have been subaerial, but which would need to have occurred underwater during the Flood, is the welding of hot pyroclastic flows into a hard volcanic rock called welded tuff. A welded tuff, one type of ignimbrite, is a glass-rich, pyroclastic rock that was indurated when the glass shards welded together. Welding was produced by the combined action of the heat retained by particles of ash, the weight of overlying material and of hot gases.1 The temperature of welding is usually greater than 580–600°C.2 Because the welding temperature is so high, uniformitarian scientists use welded tuff as an indicator of a subaerial, or at best a shallow marine paleoenvironment.3 On first thought this seems logical because we would expect a hot pyroclastic flow, whether erupting underwater or erupting on land and flowing into the water, to mix rapidly with the water, quench and cool before welding could occur. This and other dilemmas facing creationists in geology can be resolved once we realize three main interpretive problems: 1) there are still many unknowns in the geological sciences, 2) scientists almost always view past processes with strongly uniformitarian glasses, and 3) catastrophes such as the Genesis Flood add variables that trump uniformitarian deductions. In the case of welded tuffs, we should first determine whether there are any cases of welded tuffs within marine rocks. Recently, the case for the underwater welding of tuffs has become stronger, thanks especially to the work of Peter Kokelaar and his colleagues. For instance, in the Sierra Nevada Mountains of California a subaqueous explosive eruption emplaced pyroclastic material up to 30 m thick and this subsequently welded.5 This welded tuff was discovered within a 5.5-km thick section of tuff and sedimentary strata at Mineral King. Evidence for underwater welding comes from marine sedimentary rocks above and below the entire section with no evidence of subaerial or fluvial sedimentation or wave-generated sedimentary structures between marine layers. Kokelaar and Stephan Königer6 re-examined the Pitts Head Tuff, North Wales, that earlier research claimed had erupted on land and flowed into the water.7 (This tuff is dated as Ordovician by uniformitarian scientists, but almost all creationist geologists would consider it to be a Flood deposit.) The tuff is long and narrow and ranges from zero to 127-m thick with a flat top. It has variable bottom relief as if deposited in a trough or graben. Both the subaerial and subaqueous portions of the tuff have welded. The basal 1.5 m is not welded nor is the top, which is to be expected due to contact with a cooler environment. The researchers deduced that the tuff welded in water at least 50 m deep with its top above water. Of course, the paleo­environmental deductions, such as water depth, are based on uniformi­tarian assumptions. Such deductions may be quite different from the real situation because of erroneous uniformitarian assumptions.8 Never­theless, the field evidence for underwater welding of the Pitts Head Tuff seems solid. This evidence includes 1) marine sedimentary rocks with brachiopod fossils beneath the tuff, 2) the occurrence of sediment-filled gaps in the ignimbrite, and 3) the abundant evidence at the base of wet sediment fluidizaton and vesiculation by steam. A high mass flux implies rapid extrusion of pyroclastic material and rapid extrusion would provide the large volume of hot material needed to remain hot enough to produce welded tuff. One would not expect the bottom or the top to weld due to their contact with water and air. A high extrusion rate may be the key to explaining how hot pyroclastic material welded underwater during the Flood. Figure 3. Base of Rattlesnake Ignimbrite, just below the welded tuff, showing random pumice clasts. 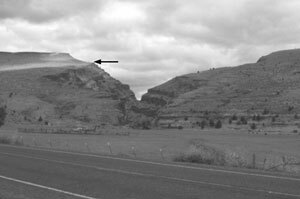 In June 1999, I, along with several other creationist geologists, examined the Rattlesnake Ignimbrite in the John Day Country of North-Central, Oregon. This ignimbrite is supposed to be a typical subaerial welded-tuff. All of the volcanic formations in the John Day Country are considered subaerial and of Cenozoic age by uniformitarian scientists. Hence, we first had to determine whether the John Day Country deposits were from the Flood or post-Flood. It became quite obvious once we started examining the area that these deposits had to be laid down during the Flood. The main reason is the enormous amount of erosion that has occurred in the region, dissecting the plateau into deep valleys. This erosion is many orders of magnitude more than would be expected in the 4,300 years after the Flood. Furthermore, there is no sign of erosional debris anywhere down the river valleys. Clearly, the debris has been transported completely out of the region. Deep, dissected valleys, as observed in the area, are typical of what is to be expected during the Dispersive Phase of the Recessive Stage of the Flood.10 This means that the Rattlesnake ignimbrite, one of the highest formations stratigraphically in the region, was emplaced during the Flood, most likely underwater and subsequently uplifted. We next considered whether the deposition of this ignimbrite was consistent with an underwater origin. The Rattlesnake Ignimbrite outcrops over a wide area of eastern Oregon as erosional remnants of capping rimrock high up on the sides of deeply eroded valleys11,12 (Figure 1). These outcrops indicate that the ignimbrite at one time covered an area of at least 30,000 to 40,000 km2 (Figure 2). Its thickness, ranging from 15 to 30 m, is remarkably uniform and its original volume was more than 280 km3 . So, the deposit is uniformly thin and widespread and is considered to be a high-energy, rapidly flowing ash-flow tuff.13 The location of the eruption caldera, which has since been eroded away, can be discerned by the decrease in pumice fragments in the welded-tuff and the degree of welding.14 The sheer physical size of the welded tuff and the continuous nature of the deposit demonstrate that extrusion was rapid, and therefore welding could have taken place underwater. We examined the rimrock north of Dayville, Oregon, at the north end of the outcrop in the northern John Day Valley to see whether an underwater origin was consistent with our understanding of the area. We noted that pumice clasts were widely and randomly dispersed within the tuff (Figure 3), implying that the tuff spread out as a density current or slurry, like a debris flow. We also noted that the bottom of the tuff was not welded for a vertical distance of about 5 m. The top of the ignimbrite was covered with about 75 m of subrounded basaltic pediment gravel (Figure 4). But in one location, discovered by John Hergenrather, 10 m of unwelded tuff lay over the welded tuff, indicating that, in the areas covered by the pediment gravel, most of the soft top of the Rattlesnake Tuff had been eroded by the gravel. All of this is consistent with the volcanic ash being emplaced underwater and the middle of the flow remaining hot enough to fuse into welded tuff. How could light pumice clasts become randomly mixed into the tuff if it was deposited and welded underwater? It is now known that pumice can be deposited underwater, and that pumice falling from air into the water can immediately sink.15,16 The pumice sinks because the hot air in the pores suddenly contracts and water is sucked into the pumice, and also because some of the water turns to steam within the pumice, which expels the air before condensing into steam again. This causes the pumice to become heavier than water and sink, mixing into the bottom-hugging pyroclastic flow. Figure 4. Coarse pediment gravel above Rattlesnake Ignimbrite containing mostly subrounded basalt boulders up to 1 m along their long axis. I conclude that the Rattlesnake Ignimbrite, Late Miocene within the uniformitarian system, was deposited during the Late Abative Phase of the Recessive Stage of the Flood. This is because it stratigraphically overlies the Columbia River basalts (Figure 1) that were likely laid down as a huge sheet in the Late Abative Phase.17 This timing is also indicated by the uniform thickness of the tuff.13 A regular thickness implies that, at the time of the eruption, the topographical relief was very low over a wide area, which is consistent with conditions during the Late Abative Phase. Since emplacement, the deposit has been severely dissected by deep valleys, which form a new relief some 1,000 m below the rim of the plateau.13 It is clear that the John Day Valley was dissected very rapidly after the tuff was deposited because the ignimbrite is tilted slightly downward towards the long axis of the valley. Such dissection and tectonics are consistent with the Dispersive Phase of the Flood. Pediments, which are widespread in the John Day Valley, are anticipated to form in the Dispersive Phase.18 Since the ignimbrite is usually found at high elevations on top of thousands of metres of earlier Flood volcanic and sedimentary rock, the Late Abative Phase, just before the Dispersive Phase, seems the most reasonable time for the emplacement of the ignimbrite. Contrary to conventional uniformitarian thinking, ignimbrites can fuse underwater to form welded tuffs. Recently a tuff in the Sierra Nevada Mountains has been reported as being emplaced and welded subaqueously. And a tuff in North Wales, previously interpreted as deposited subaerially, has been shown to have been deposited underwater. In this case, the field evidence includes marine sequences beneath the tuff, sediment filled gaps within the tuff, and wet sediment fluidisation and steam vesicles at the base of the tuff. One process that is generally assumed by uniformitarians to have been subaerial, but which would need to have occurred underwater during the Flood, is the welding of hot pyroclastic flows into a hard volcanic rock called welded tuff. The observed field relationships with the Rattlesnake Ignimbrite in Eastern Oregon show that it was deposited during the Late Abative Phase of the Flood, and thus, most likely underwater. An underwater emplacement is also supported by the fact that the ignimbrite is only welded in its middle portion and not at its base or top. The most important factor for underwater welding is a high extrusion rate, which is exactly what is expected on the scale of the Genesis Flood. Scientists have probably held to the idea of subaerial emplacement because they have never observed submarine welding in a modern environment. This is understandable because modern flows are only small and subaerial, and rarely end up in the ocean. However, much larger ignimbrites than are observed today ‘… are common in the geological record, but which have never been witnessed.’19 Such huge pyroclastic flows would be expected to weld underwater and the scale of the Genesis Flood fits the size of the deposits observed in the rock record. Bates, R.L. and Jackson, J.A. (Eds), Dictionary of Geological Terms, 3rd Edition, Anchor Press/Doubleday, New York, p. 560, 1984. Return to text. 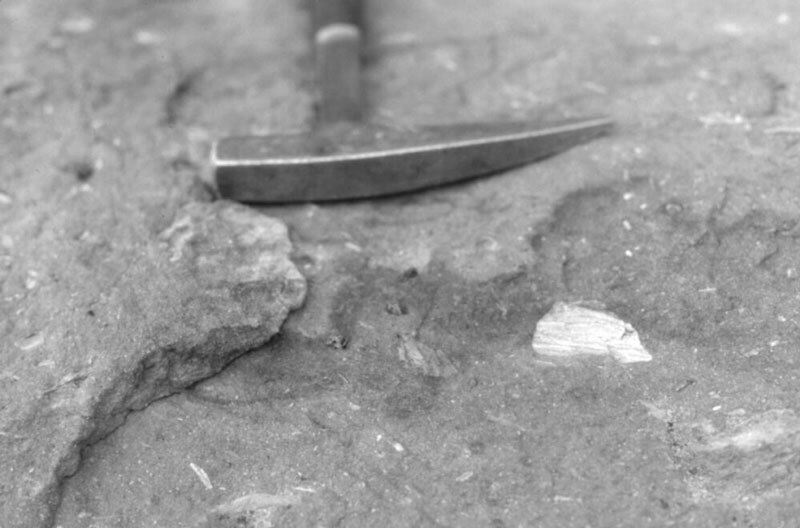 Kokelaar, P. and Königer, S., Marine emplacement of welded ignimbrite: the Ordovician Pitts Head Tuff, North Wales, J. Geological Society, London 157:531, 2000. Return to text. Cas, R.A.F. and Wright, J.V., Volcanic Successions: Modern and Ancient, Allen and Unwin, London, p. 270, 1987. Return to text. Cas and Wright, ref. 3, pp. 269–284. Return to text. Kokelaar and Königer, ref. 2, pp. 517–531. Return to text. Reedman, A.J., Howells, M.F. and Campbell, S.D.G., The Pitts Head Tuff Formation: a subaerial to submarine welded ash-flow tuff of Ordovician age, North Wales, Geological Magazine 124(5):427–439, 1987 Return to text. Froede, Jr., C.F., Field Studies in Catastrophic Geology, Creation Research Society Monograph No. 7, Creation Research Society, St. Joseph, 1998. Return to text. Kokelaar and Königer, ref. 2, p. 533. Return to text. Walker, T., A Biblical geologic model; in: Walsh, R.E. (Ed. 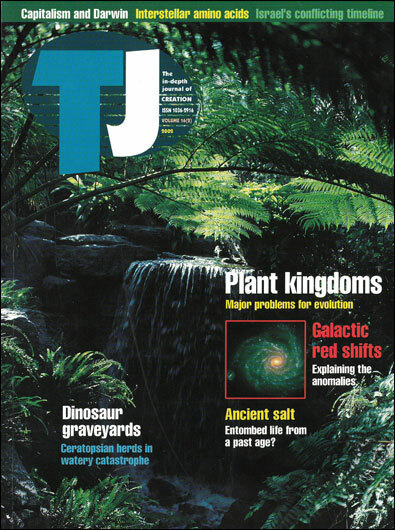 ), Proceedings of the Third International Conference on Creationism, Technical Symposium Sessions, Creation Science Fellowship, Pittsburgh, pp. 581–592, 1994. Return to text. Streck, M.J. and Grunder, A.L., Crystallization and welding variations in a widespread ignimbrite sheet; the Rattlesnake Tuff, eastern Oregon, USA, Bulletin of Volcanology 57:151–169, 1995. Return to text. Streck, M.J., Johnson, J.A. and Grunder, A.L., Field guide to the Rattlesnake Tuff and High Lava Plains near Burns, Oregon, Oregon Geology 61(3):64–76, 1999. Return to text. Streck and Grunder, ref. 11, p. 154. Return to text. Streck et al., ref. 12, p. 66. Return to text. Nishimura et al., Pliocene-Quaternary submarine pumice deposits in the Sumisu rift area, Izu-Bonin Arc; in: Fisher, R.V. and Smith, G.A. (Eds), Sedimentation in Volcanic Settings, Society for Sedimentary Geology Special Publication No. 45, Society for Sedimentary Geology, Tulsa, pp. 201–208, 1991. Return to text. Woodmorappe, J. and Oard, M.J., Field studies in the Columbia River basalt, north-west USA, Journal of Creation 16(1):103–110, 2002. Return to text. Oard, M.J., Vertical tectonics and the drainage of floodwater: a model for the Middle and Late Diluvian Period—Part II, CRSQ 38(2):83–87, 2001. Return to text. Streck and Grunder, ref. 11, p. 152. Return to text. Streck et al., ref. 12, p. 67. Return to text.